Every district in the state holds its membership meeting or BWA convention annually. It is usually hosted by BWA unit(s) on a rotating basis. These events are well attended since all members are invited to participate and much camaraderie is evident. The format is quite similar — a religious service, general membership meeting with a guest speaker and luncheon followed by a program. The afternoon program vary depending on the host unit(s), i.e. entertainment by representatives of each unit or a special program selected by the host. See the calendar for dates of district membership meetings/conventions. 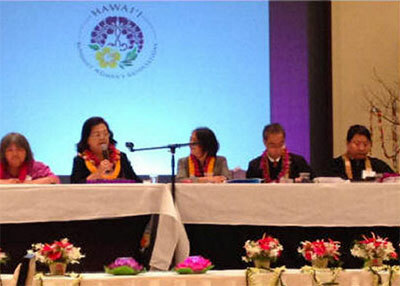 Every four years, the Hawaii Federation of Buddhist Women’s Associations holds a State Membership Conference. This is held the year preceding a World Convention. 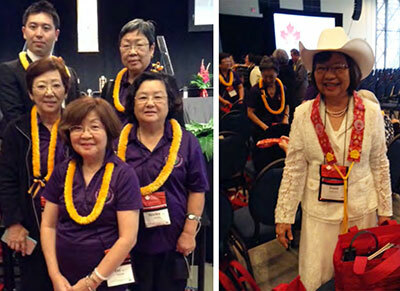 Since it is hosted by different districts in turn, in 2014, the Hawaii Island United BWA hosted the 12th State Membership Conference at Sheraton Kona Resort & Spa. The program consisted of services, Dharma speakers, workshops, and resolutions. New business items by Uniteds, Units, or even individuals are highly encouraged. The first Buddhist Women’s World Convention was held in March 21-22, 1961 in Kyoto, Japan and is held once every four years at one of the five World districts (Japan, Hawaii, Buddhist Churches of America, Jodo Shinshu Buddhist Temples of Canada, and South America). Members in these Districts attend this Convention to share information, to unite in spirit and purpose, to strengthen our beliefs in Jodo Shinshu, and to promote world peace. Awake to oneself being nurtured by compassion of Amida Buddha. Waldorf Astoria Hotel, New York City, N.Y.